KB17044 - "Facility" in Syslog Servers window under Log/Monitoring tabs: What does it mean? KB43581 - XML import fails with error message "Invalid value for identifier server"
This article provides information on how to configure the Syslog server. 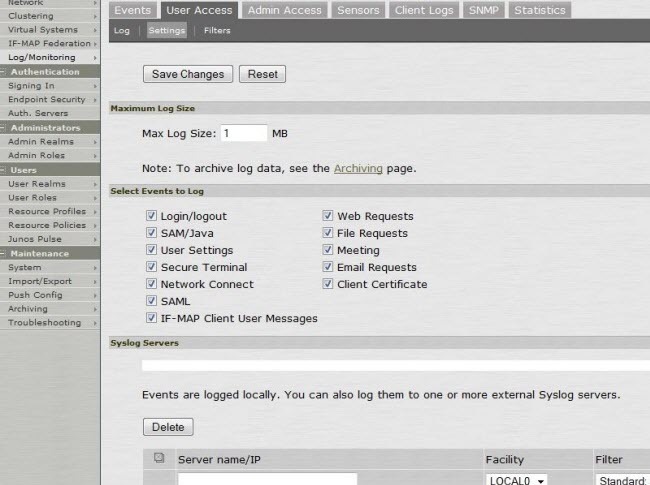 Automatically send logs to the Syslog server. 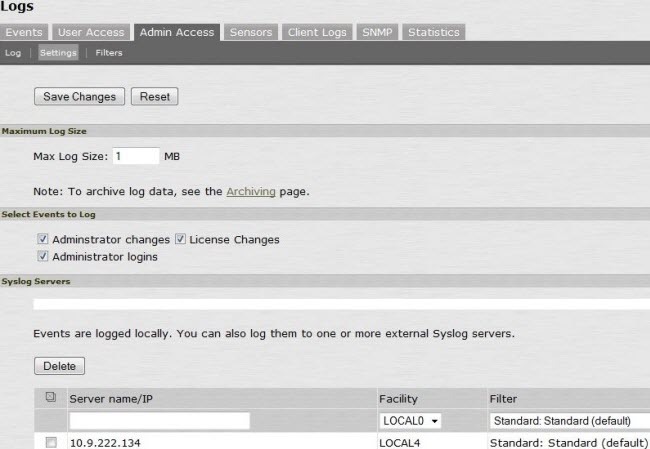 The System > Log/Monitoring pages allow you to specify which events to log, the maximum file size for the system log, and whether to log events to the syslog server in addition to logging them locally. It also lets you view the specified number of events, save the log files to a network, and clear the logs. When you clear the local log, the events recorded by the syslog server are not affected. Subsequent events are recorded in a new local log file. Enter a facility for the server. PCS Series devices provide 8 facilities (LOCAL 0-LOCAL7), which you can map to facilities on the syslog server. (Central Manager only) Select the filter to apply to the log file. Repeat the same process for multiple servers, if required, using different formats and filters for different servers and facilities. facility =LOG_USER and level = LOG_INFO.